Already banned in many deep-state sub Saharan African countries as toxic, dangerous, possibly cancer producing dirt covering which coagulates and begins to melt above temperatures as low as 74 degrees fahrenheit, sticking to the shoes of the children using Monroe and Hollywood Boulevard to reach their homes, tracking this posssiobly toxic substance into their homes and sticking to their driveways, hallways, carpets, tiles and other floor coverings, Clark County's Department of Pulbic Works under the direction and control of the Clark County Board of Commissioners headed by Steve Sisolak, Chairman, self appointed candidate for Governor of Nevada, already the beneficiary of hundreds of thousands of dollars in Cannabis taxes are greedily forcing us homeowners to endure this third world paving substance for sidwalks in front of our homes on Hollywood Boulevard, north of Monroe to be tracked in the houses of hundreds of school children walking home from Michael O'Callaghan Middle School (The Mike O'Callaghan–Pat Tillman Memorial Bridge was completed on October 14, 2010. the O’Callaghan Resource Integrated Oncology Network (ORION) Cancer Foundation, a nonprofit charity that assists cancer patients in Nevada was established in honor of Mike and Carolyn O’Callaghan, both cancer survivors.) 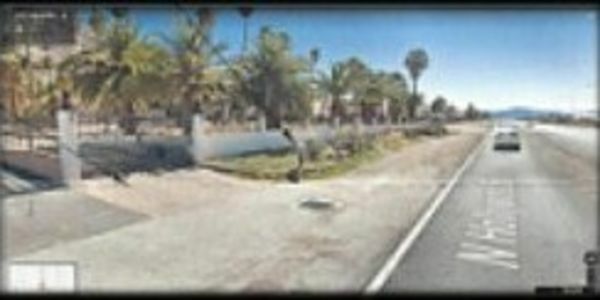 While every single sidewalk ever previously poured in Sunrise Manor is cement compound the Clark County Department of Public works has unilaterally, unfairly and dishonestly decided to start using this black tar possibly toxic material to pave our sidewalks for the hundreds of children of Michael O'Callaghan Middle School walking to and from their homes to school. This decision to use this black tar like possible toxic substace was unilaterally decided on without the specific approval of the Clark County Board of Commissioners under the direction of Steve Sisolak chairman, self appointed candidate for Governor of the state of Nevada. This letter wirtten and signed by Joseph Vatson, Manager, Design Engineering Division, Department of Public Works, Denis Cederberg, P.E. Director. The Department of Pujblicv Works has greedily dumped on Hollwyood Boulevard fronting homowners using this possibly toxiz, cancer producinf substance to save a few dollars from their hundred thousands of dollars rodeway budget. We have the money, the manpower and the political advantage. If you insist on asphalt sidewalks we will be happy to see you in court. We will not allow you to devalue our homes, and possibly contaminate our children who attend Michael O'Callaghan Middle School for the sake of saving a few dollars on sidewalks. In your wildest imagination you can't believe that you are going to get away with cement sidewalks all around the homes of lesser value in Sunrise Manor and then treat the much more valuable estates fronting on Hollywood Blvd. with messy, dirty, possibly toxic and cancer producing asphalt sidewalks. We pay the same property taxes as those homes with cement sidwalks and we expect the same quality.